LANCO, Granger Smith (feat. Earl Dibbles Jr.), Maddie & Tae, Chris Lane, Tracy Lawrence & Restless Heart to Join Headliners Luke Bryan, Toby Keith & Luke Combs at Country Thunder Florida! 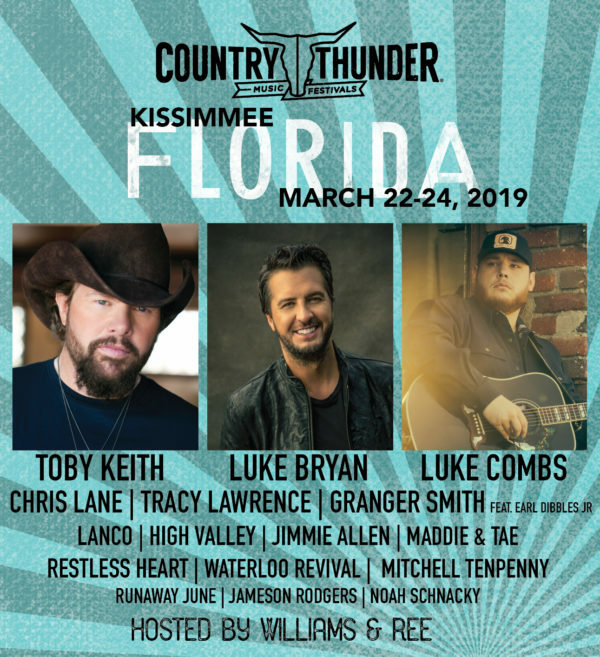 | 2911 Enterprises, Inc.
KISSIMMEE, Fla. – Country Thunder Florida 2019 has added six more performers to play the inaugural central Florida festival, March 22-24 in Kissimmee, Fla. LANCO, Granger Smith (feat. Earl Dibbles Jr.), Maddie & Tae, Chris Lane, Tracy Lawrence and Restless Heart join previously announced headliners Toby Keith, Luke Bryan, and Luke Combs. Last month’s second-wave announce highlighted fresh talent of High Valley, Jimmie Allen, Waterloo Revival, Mitchell Tenpenny, Runaway June, Jameson Rodgers, and Noah Schnacky. Main stage superstars, red-hot up-and-comers and veteran artists who have stood the test of time are sure to cure country cravings and fulfill spring break dreams in the Sunshine State! LANCO is riding high on the heels of its No. 1 smash, “Greatest Love Story,” while Granger Smith has enjoyed two consecutive top-5 albums with Remington and The Good Guys Win. Brace yourself for an appearance from his alter ego, Earl Dibbles Jr.!